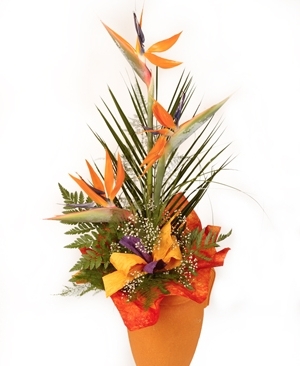 Paradise Bird - an impressive paradise bird bouquet ! Elegant size: 5 Paradise Bird, Gypshophila, Plumoza, Leather Leaf, Palm Leaf, Bear Grass. Medium size: 3 Paradise Bird, Gypshophila, Plumoza, Leather Leaf, Palm Leaf, Bear Grass. Small size: 1 Paradise Bird, Gypshophila, Plumoza, Leather Leaf, Palm Leaf, Bear Grass.